Walter Isaacson, who wrote the Steve Jobs book, tells us that teamwork matters more than individual brilliance. Those who handle the books sections of newspapers and magazines often wonder if the reviews they publish have been written after having read the book. The reviewers, though, will hear none of it. This, therefore, is a review with a difference. The reviewer admits that he has not read the book, not all of it anyway. The excuse for that is a combination of his laziness and Walter Isaacson's meticulousness in compiling a 168-year timeline of the development of the computer and Internet. It is a joy to get lost in it. However, the reviewer has read enough of the book to divine that Ada, Countess of Lovelace never got her due. That is not unique to her. In the history of technology, the contribution of hundreds has been consigned to the recycle bin, or deleted permanently. There is a thing called the Creation Myth in the Silicon Valley. These are tales of successes and failures somewhat based on the truth. They are largely happy stories shorn of the dark passages of chicanery, deceit and denied credit. Every other man has a sob story. However, in general, the lot of women has been worse. And it began at the beginning. Lovelace, the only legitimate child of the poet Lord Byron, died in 1852 at the age of 36. Her father had died at the same age in 1824, when she was just nine. Their association, though brief, was enough for Lord Byron to infuse in her some of his romance and rebelliousness. As a teenager she fell for one of her tutors and tried to run away to be with him. Her mother Annabella sought to rein her in by putting her into mathematics, which lead to a happy fusion that Ada liked to call poetical science. She presented path-breaking notes on computing to Scientific Memoirs, an English scientific journal, in 1843. Disbelieving editors of the journal could not comprehend that a woman could write those notes. They thought Lovelace's colleague, Charles Babbage, was too coy to take credit. This would be a good juncture to appeal to Sheryl Sandberg to take note; after all the Facebook COO is a modern day fountainhead of feminine awareness, telling women the world over to Lean In. But such an exhortation would be unnecessary. Sandberg has already taken note. She says in a New York Times article on how the book came to be: "Stereotypes are very reinforcing because as human beings we expect what is familiar. In tech, girls don't code because girls don't code." All right, but a surprisingly large number of women did math 80 years ago. As many as 113 American women got their doctorate in math in the 1930s. That was 15 per cent of all American math doctorates. The number fell to 106, only 4 per cent, in the 1950s. Grace Hopper, who created the programming language Cobol and coined the term "computer bugs", obtained her math doctorate in 1934, the 11th American woman to get it from Yale, the first being in 1895. Ada, though not a particularly gifted mathematician, towers above them all. In fact, the Lady Lovelace's Objection remains unconquered to this day, though many challenges have been posed to it. It was Ada's contention that no computer, no matter how powerful, would ever truly be a thinking machine. Alan Turing, who was conceived in Chhatrapur, in India, and born in London in 1912, and who made seminal contributions to development of computers, sought to dismiss her objection by providing an operational definition of a thinking machine. The leitmotif of Isaacson's book is teamwork - that most of the innovations of the digital age were done collaboratively. But in the 60 years since then, all we have got is a computer that defeated Gary Kasparov and another that won Jeopardy. The real thinking machine remains confined to celluloid, most notably in Stanley Kubrick's 2001: A Space Odyssey, which has intelligent computer HAL, when threatened, killing his human masters one by one. A real life HAL is yet to arrive. And that would please Ada, as would Isaacson's focus on her and her work. However, another woman, Ayn Rand, the novelist-philosopher known for her belief in individual brilliance and her dislike for collectivism and altruism, would not be happy with Isaacson. The leitmotif of Isaacson's book is teamwork - that most of the innovations of the digital age were done collaboratively. 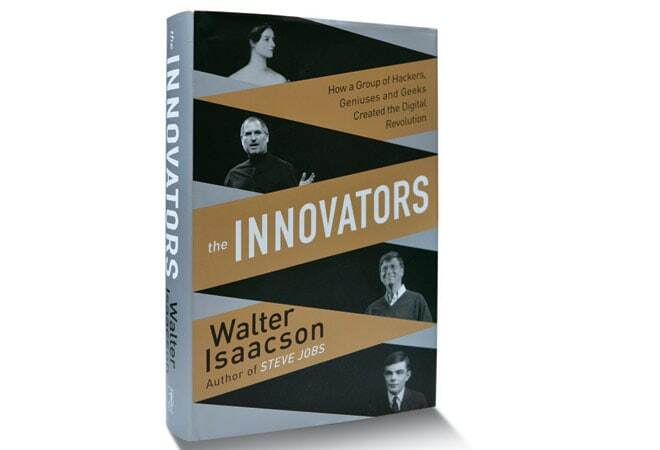 Isaacson has himself written much-acclaimed biographies of individuals, the best known of them being the one of Steve Jobs. In this book, though, he is determined to extol collaborative creativity, which, he believes, is how innovation actually happens in the real world. This takes him headlong into the debate over whether the history of the world is a collection of biographies of great individuals or whether the role of societal forces is greater. This book itself is a creation of collaboration, not all of it intended. The idea for it came to Isaacson when his daughter Betsy, after much pestering by her parents, wrote a college essay on Ada. Isaacson was stunned into silence when the daughter revealed her subject. He was about to start work on the Jobs book and could not recall who Ada was. Once he started working on this book, he wanted to make it about the evolution of the Internet. It was Bill Gates who, during an interview, convinced Isaacson that the simultaneous emergence of the personal computer and the Internet was a more compelling story. Still, for all of Isaacson's belief in collaborative creativity, his liking for some individuals, most notably Ada, comes through every now and then. He both begins and ends the book with her. Talking about endings, now that this review is done, let's finish reading the book. Isaacson is determined to extol collaborative creativity, which, he believes, is how innovation actually happens in the real world.